Remember when you could walk into a fast-food restaurant, pay a few cents extra, and get a real glass featuring your favorite comic-book or cartoon character? Well, you might be grown-up now, but PopFun is going to bring back that fun to your favorite barware with 'Toon Tumblers! 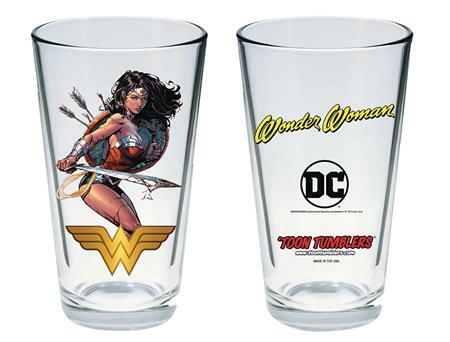 This Tumbler featuring a colorful print of Wonder Woman as drawn by David Finch on high-quality pint glasses! The pint glass holds 16 ounces and stands about 5 3/4' tall.